Thinking back on holiday memories you've experienced in your lifetime, it would not be surprising if two themes dominated. For many consumers, the holidays are all about spending quality time with friends and family, interspersed with online and offline shopping experiences as they search for the perfect gift to purchase. As part of the POPSUGAR Insights 2017 Holiday Report, we asked 3,000 US women to tell us what they value most about the holiday season and the activities that they enjoy the most. 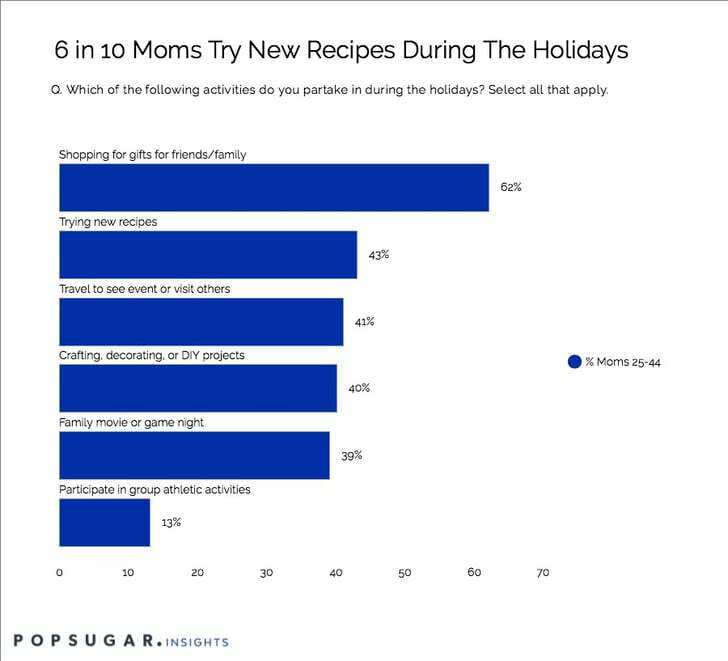 Moms enjoy shopping for gifts (62%), trying new recipes (43%), and traveling to see events or visit others (41%) during the holidays. Other popular holiday activities include crafting, decorating, or DIY projects (40%), family movie or game night (39%), and participating in group athletic activities (13%). Millennial moms also enjoy shopping (62%) and trying new recipes (45%), but prefer crafting, decorating, or DIY projects (44%) as much as they enjoy traveling to see events or visit others (44%). Other popular activities include movie/game night (41%) and group athletic activities (12%). Moms say they enjoy spending quality time with friends and family (64%), celebrating holiday traditions (33%), and eating seasonal or holiday-themed foods (31%) the most around the holidays. Millennial moms, women between the ages of 25 and 34, are more likely to enjoy spending quality time with friends and family (69%), celebrating holiday traditions (36%), and eating season-themed foods (34%) than moms overall. Millennials are also two times more likely to enjoy giving and receiving gifts than moms overall.